It has been crazy cold here after all our warm weather last week. Yesterday, they delayed school expecting bad roads due to a wintry mix of precipitation. We had ZERO sleet/snow/rain so instead our kids just got extra sleep and play time on a Tuesday morning! They loved it! On Monday night, we attended a team dinner for Conner’s varsity basketball team. All of his teammates, their parents and siblings, and the coaches gathered together to eat and fellowship before their playoff game on Tuesday night. I took a dessert, Chocolate Delight, which is always a BIG HIT at our house. I thought I would share the recipe with you today! It’s perfect to take to an event because you can make it up the day before or earlier in the day and just pop in the fridge until you’re ready to go! First, I use my food processor and finely chop the nuts. I am allergic to pecans so I use walnuts but my Mom uses pecans so whatever is your preference will work! 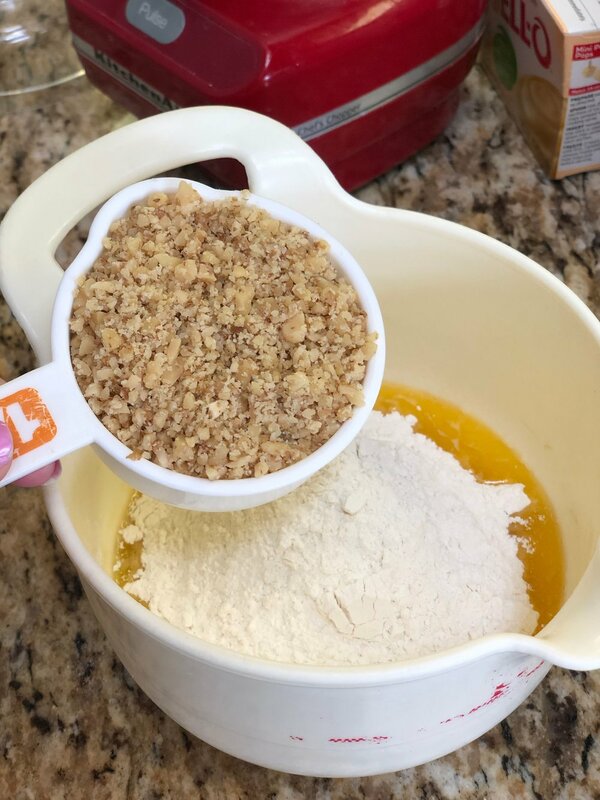 Melt one stick of butter and add 1 cup of flour and 1/2 cup chopped nuts. Mix together and then spread evenly over bottom of 9x13 pan. This makes your crust! Let cool completely. Next, mix together 1 cup of cool whip, 1 cup of powdered sugar, and 1 8oz cream cheese (softened). Spread the mixture evenly over the cooked crust. For the next layer, mix 1 small package of instant vanilla pudding and 1 large package of instant chocolate pudding with 3 cups of milk. Blend together until like custard. Then spread this over the 2nd layer. Spread the remainder of the cool whip on top and sprinkle with more nuts. Wednesday - King Ranch Joes from the Eats Cookbook by Mix and Match Mama! Friday - Homecoming which means we will grab a quick bite on the way to the game! Our trip to the East Coast in August! I shared Part 1 of our trip visiting Philadelphia yesterday. You can read that post HERE. Tomorrow, I’ll share Part 2 of our trip! It’s my very favorite Fall drink and with our recent rainy weather, it has been the perfect treat! I even found a recipe for a homemade PSL and am loving it! Look for that recipe on the blog Friday! 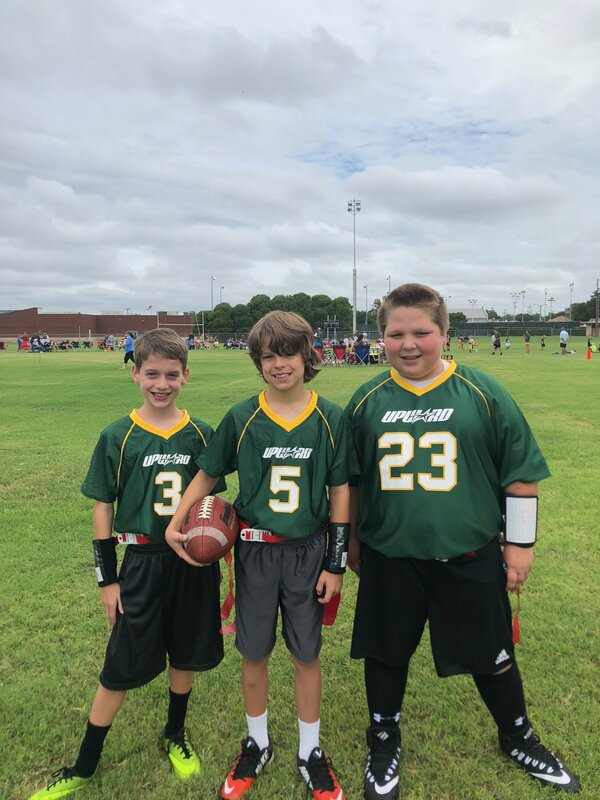 Cutter is playing his first season of flag football with cousins and loving it! I have an Open House on one of my listings this weekend so I’m working on marketing, ads, flyers, and getting everything ready to show off this cute home! I’m also scheduling some showings for my buyers as we look for the perfect homes for their families! I’m very blessed to love what I do! If you are local and looking to buy, sell, or invest in real estate, I’d love the opportunity to serve you! You can reach me at tish@redapplerealtors.net. And if you are new here, you can read about Why I Became A Realtor in my post HERE. We have Homecoming on Friday for our high school. The elementary and middle school students have early release so we can attend the Homecoming Parade! Our sweet school has a parade in the afternoon before the big game and Carson is riding on the 6th grade float this year. He is VERY excited! ﻿I’m almost finished with Crazy Rich Asians by Kevin Kwan. 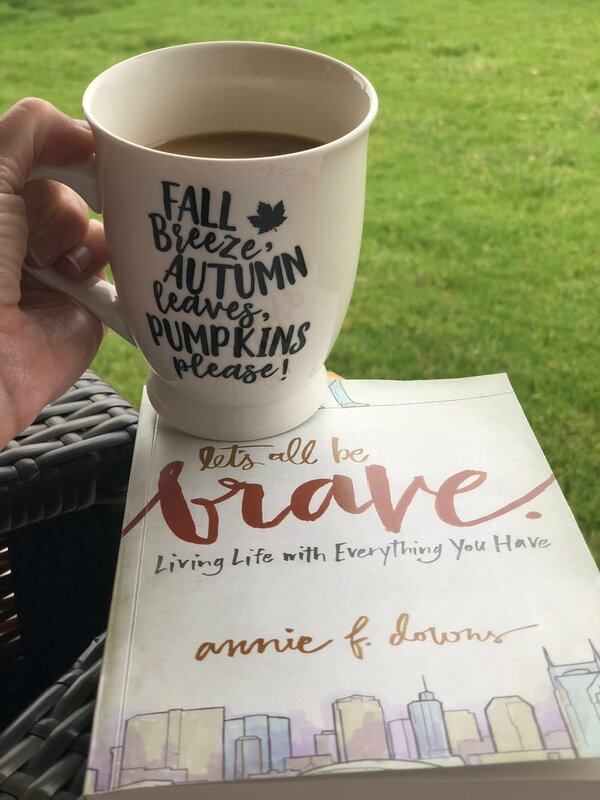 And I’ve been really enjoying Let’s All Be Brave by Annie F. Downs. BIG BROTHER of course! So excited to see the FINALE tonight! I’m team Tyler or Kaycee! Tyler has been my favorite from the start. I know he had several Top 2s with houseguests but I think he played the game really well. He won comps, he had a good social game and treated others kindly, and still stayed true to his alliance. However, I love Kaycee too! She’s a veto BEAST! Who are you hoping to win? Who are you voting for Favorite Houseguest?! At this exact moment, my Blardigan! It’s rainy and cool this morning so I’m staying cozy! However, this has been most days - shorts and sweatshirt is a Fall favorite! Mark and I are surprising Cutter and eating lunch with him on Friday to celebrate him being chosen Student of the Month! Then we have the Homecoming parade and football game. We have football and soccer games on Saturday for Cutter and if the weather is nice, we are going to the Balloon Festival that is held at a local park every year. It always has great food and so fun to see all the hot air balloons! Sunday, I’ll host an Open House after church and then you’ll find us watching all the football games on TV! Steelers and Cowboys are family favs! Celebrating this handsome guy’s birthday! And bring on Halloween costumes and candy! Well, we’ve already discussed my favorite way to drink it is a hot Pumpkin Spice Latte! My favorite way to eat pumpkin is my Pumpkin Dump cake! In a 9x13 pan, put the pumpkin on the bottom and sprinkle the yellow cake mix on top. 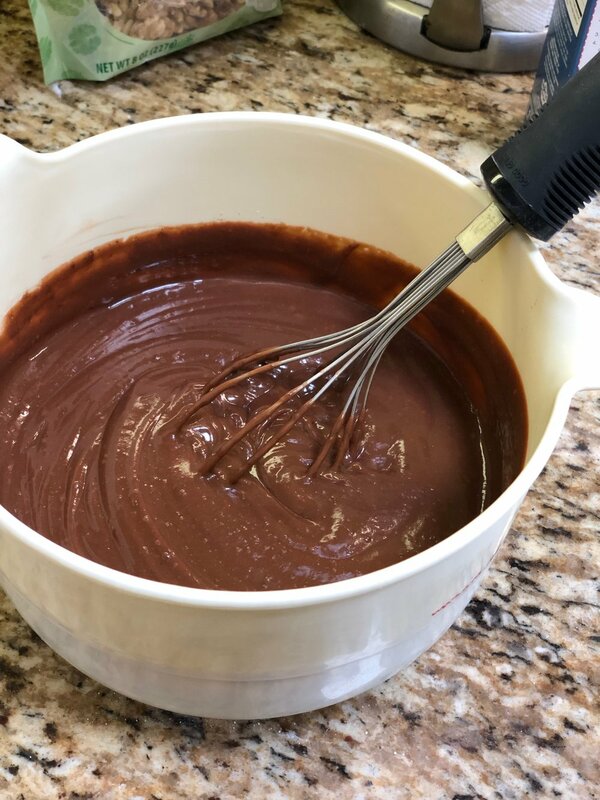 Melt a stick of butter and pour over the top of the cake mix. Cook at 350 degrees for 45 minutes. Serve with ice cream if desired! My sweet friend, Cristi, gave me this recipe almost 20 years ago and it is still a huge WIN at our house for dinner! Easy and quick supper for those busy Fall nights! 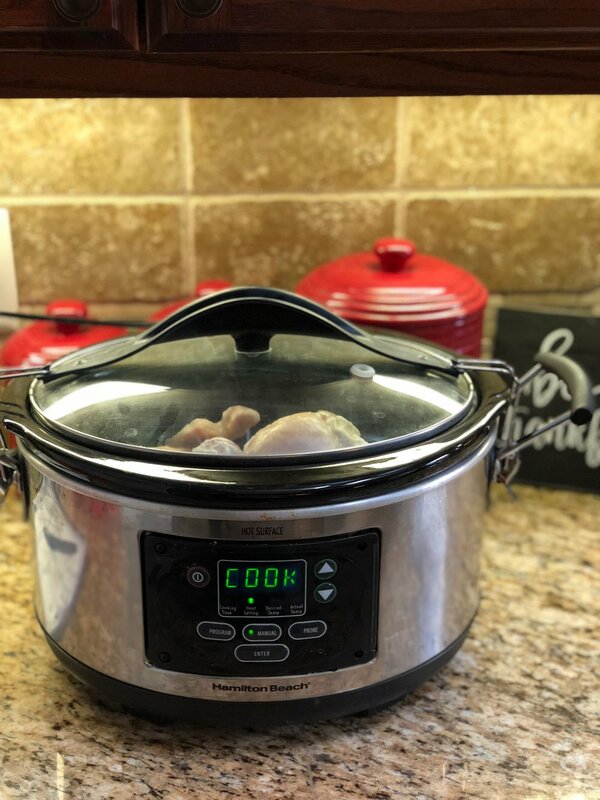 I cook my frozen chicken breasts in my crockpot with a cup of water and cook on low 7-8 hours. When it's time to assemble the enchiladas, my chicken is ready and easily shreds with a fork! About 30 minutes before you are ready to eat, assemble your enchiladas. First, mix the sour cream, cream of mushroom soup, and the green chilis in a bowl. Next, put a little of the sour cream mixture in your tortilla. I use flour tortillas because those are a favorite for my family. You could use whole wheat tortillas for a healthier option. Add some of your shredded chicken. Then roll it and add just a small dab of the sour cream mixture to the edge. Fold the tortilla over and this will help hold it together. Place in a greased 13 x 9 baking dish. Repeat until you have used all your chicken. However, keep a little of your sour cream mixture to top off the enchiladas. I make 5 chicken breasts and this recipe will make about 12 enchiladas. I use an 8x8 pan as well. Top the enchiladas with the remainder of your sour cream mixture. Bake at 350 degrees for 15 minutes or until it starts to bubble. Top with shredded cheese and bake another 5 minutes until the cheese is melted. Monday - Mexican Salad - You can find the recipe HERE. Friday - Sunday - I usually don't meal plan for the weekends because often our plans change with how many kids are home for dinner, activities, getting together with friends and family, etc. On Monday, we celebrated Cutter Maddux's 9th Birthday! How in the world is my youngest baby NINE years old?! We had a GREAT day celebrating this kiddo and how he completed our family! You can read about Cutter HERE. Spring is finally HERE! At this EXACT moment, it's storming outside and I'm listening to the wonderful sound of much needed rain! But the cool mornings and warm afternoons have been PERFECT! We are finishing up spring soccer season and had the end of season party this past weekend! Cutter won the "Mr. Flash" award for being the fastest runner on the team! We reserved a party room at a new trampoline park that just opened recently in Abilene. Our coach was sweet enough to invite siblings too so Carson joined in the fun! We still have a few more weeks of baseball games 4 nights a week so pretty much we live at the ballpark this time of year! Currently, I have two New Listings going on the market this week! I've been working on marketing plans, scheduling photo shoots, and getting all the details about these properties! I'm also working to get a few families ready to move into their new homes in May!! Closing day is coming soon and I am EXCITED for these sweet families!! I just started Girl, Wash Your Face by Rachel Hollis yesterday and LOVE it so far! This has been on REPEAT since we saw the movie. SO GOOD, friends! At this EXACT moment, jeans and my baseball t-shirt. I had lots of DM's on Instagram when I posted this pic about my T-shirt. It's a design from a few years ago from OLIVER & OTIS. My absolute favorite t-shirts are all from O&O! It was started by a sweet friend of mine and her sister. They have the CUTEST designs in FUN colors and THE BEST quality! And Bonus, if you order 3 shirts, you get a 4th logo shirt FREE! Head on over and check em out HERE! You'll LOVE them! Cutter has his last soccer game on Saturday. Carson is going with our Children in Action group at church to Lake Brownwood for a campout and Conner is playing in a basketball tournament in Duncanville. All of the end of the year FUN at school! Field trips, award ceremonies, sports banquets, parties, and MORE!